The Inside Bar (IB): The IB pattern is defined as a bar that has range which is completely encompassed by the previous bar’s range. The prior bar’s high is higher than the current bar’s high and the prior bar’s low is lower than current bar’s low. The Narrow Range Inside Bar (IB4): The IB4 pattern is a bar that has range which is completely encompassed by the previous bar’s range with a range that is narrower than the previous three bars’ ranges compared individually. The Narrow Range Double Inside Bar (DI5): The DI5 pattern is an inside bar that is preceded by an IB4 bar. The Narrow Range Bar (NR7): The NR7 pattern is defined as a range which is narrower than any of the previous 6 bars. The 2 Bar Narrow Range (2NR): The 2NR pattern is the narrowest 2 bar range relative to any two bar range within the previous 20 bars. The 3 Bar Narrow Range (3NR): The 3NR pattern is the narrowest 3 bar range relative to any three bar range within the previous 20 bars. Both 2NR and 3NR pattern represent a period of contraction that can occur during volatile as well as in consolidating market scenarios. The Range Analysis indicator also comes with the option of displaying Wide Spread and Outside Bars. 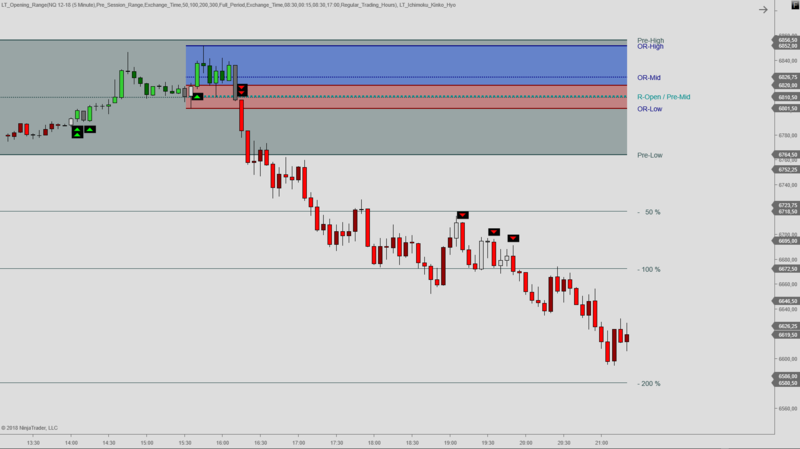 In the following however, we will look at how to combine narrow range patterns with the opening range. From a psychological perspective, short term and retail traders tend to ignore markets that consolidate. However, it is exactly these scenarios we should be looking for in order to position ourselves. Again, narrow range markets tend to precede trending days. 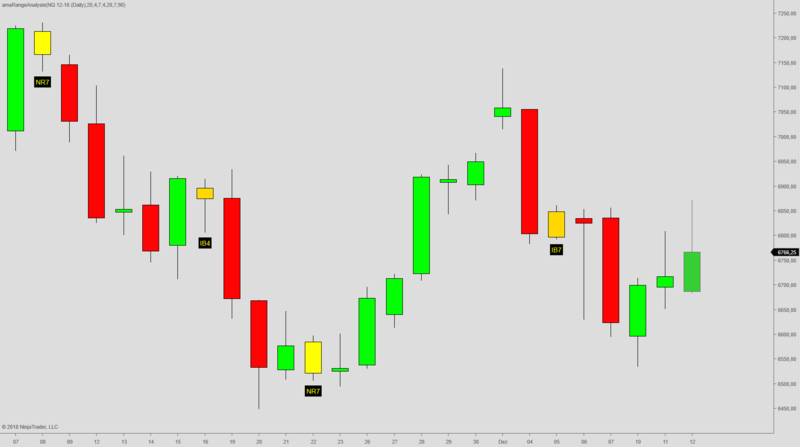 Specifically, Crabel applied the above patterns on daily charts when trading opening range breakout. The assumption is that a new trend will align with the direction of the opening range breakout. Trades are therefore entered in the direction of the breakout. Long positions at the breakout above the opening range high and shorts at the breakout below the opening range low. Once the market has moved away from the the open, it should not return to this level. If is does, it is most likely not a trending day and the setup should be invalidated. Therefore, a trailing stop can be set at the open following the initial move off the open. Targets can be set at pre-session high/low levels, alternatively at the 50%, 100% and 200% pre-session extension levels, available from the premium Opening Range indicator.